Comedy duo Cannon and Ball and comedy queen Su Pollard (Hi-de-Hi!, You Rang, M’Lord) team up for an all-out outrageous side splitting romp. Ha Ha Hood! 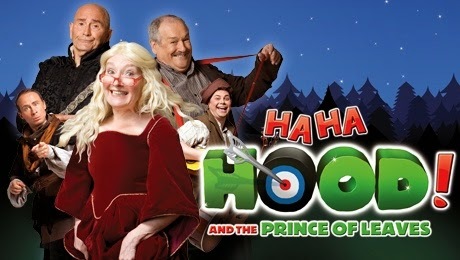 And The Prince of Leaves is the latest laugh-out-loud production from the Ha Ha! team who had us rolling in the aisles with Ha Ha Holmes!, Ha Ha Hitler! and Ha Ha Hamlet!. Created by Ben Langley, who also takes on the mantle of Robin, Ha Ha Hood! Prince of Leaves gallops to the Edinburgh Playhouse on Monday 29th September. Maid Marian, Nottinghamshire’s feistiest female, who has in the past been brought to life by the likes of screen goddesses Audrey Hepburn, Cate Blanchett and Uma Thurman is now portrayed by Su Pollard, who serves up a world-weary Marian who is definitely more matron than maid! Tommy Cannon takes on the evil Sheriff of Nottingham and Little John while Bobby Ball, currently starring in TV’s Not Going Out with Lee Mack, doubles up as Friar Tuck and Guy of Gisborne.